I go on all the time about amazing skincare products, because lets face it, it’s what I love doing. I try and test so many different ones and for people who aren’t so skincare aware, you’re probably thinking… da fuq. 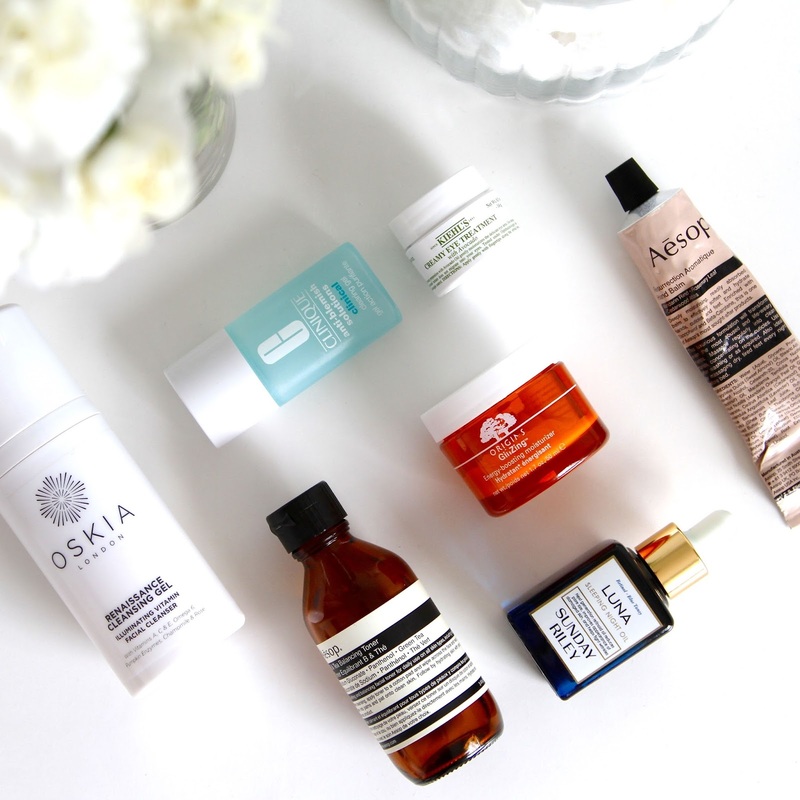 Today I thought I’d show you all my favourite product in each skincare category. I know my taste in skincare is a little expensive at times (way too expensive for my own bank balance), so don’t be put off by the product price thinking that this is the one that you must buy etc. It’s an interest of mine so I do like to invest in my products, however if you’re a long time reader of The G Edit, you’ll know I love and use regally products from Lush, The Body Shop, La Roche Posay and other affordable brands. Today I just thought I’d narrow down my LOVE LOVE LOVE, swear by products for each category, to show you my ultimate skincare routine. In other words, if someone said which products would you take if you were stuck on a desert island, this would be it…. ENJOY! 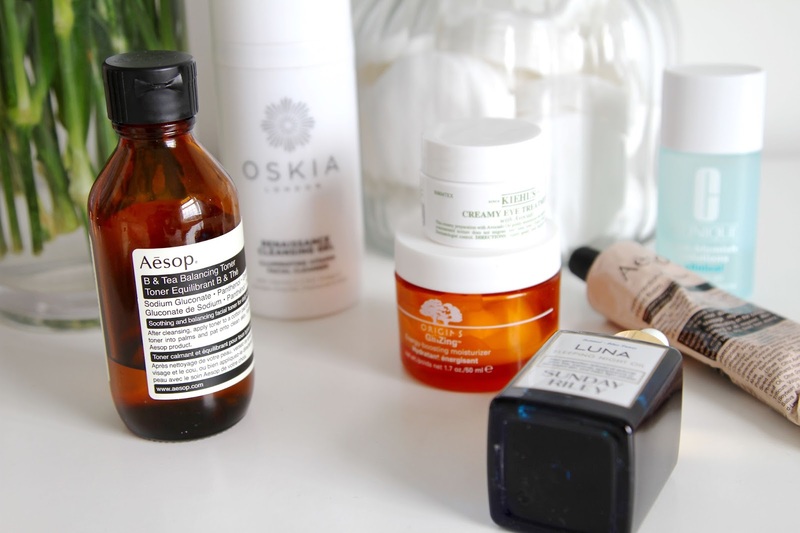 When it comes to a cleanser, balm and oil cleansers are my all time favourite. They are quite weird to use at first and the texture takes a while to get use to, but once you’ve thrown yourself in… you’ll fall in love. My all time favourite is the OSKIA Renaissance Cleansing Gel £28. This facial cleanser is jam packed with essential oils and vitamins, to give you the best cleanse possible. Containing Vitamin A, C, E, Omega, Pumpkin Enzymes, Chamomile and Rose, it is full of skin healing goodness to give you a rejuvenated appearance. I use a warm cloth to remove this and to give a gentle exfoliation at the same time. My favourite toner hasn’t changed for years now, and it still remains to be the Aesop B & Tea Balancing Toner £23 100ml. I’m straight in there when anything says ‘balancing’ on the label because this means they are designed to even and harmonise your skin. It has a gorgeous herbal scent to it and leaves your skin feeling dewy and healthy unlike some toners that strip and leave your face feeling tight. I’ve being using this for around 3 years now so it has a very secure place in my skincare drawer. I love a good moisturiser. My skin can get very dry at times especially in the cold weather so I tend to go for something that’s in a gel form, keeping my skin hydrated all day without the greasy after effect. There is nothing better and more suited than the Origins Ginzing Energy Boosting Moisturiser £24. I am literally onto my 4th tub of this I just can’t get enough. From the orange scent to it’s light texture, it is simply the best moisturiser I have ever tried. LAV. IT. LAV. IT. This product is something I haven’t had for a very long time, but when I purchased it, it became my favourite immediately. The Kiehls Creamy Eye Treatment With Avocado £20 has a subtle smooth texture that sinks right into your skin straight away on application. It completely awakens your eyes (is that even a word) and gets to work reducing the appearance of dark circles and wrinkles. If I can say one skincare product I am in love with, it would be this. I haven’t came across another product that I love more than the Sunday Riley Luna £85. It is as well one of the most expensive skincare purchases I’m yet to take, but by far the most worth it. Every product in this bottle of goodness is there for a reason, and when you wake up in the morning, your skin looks so healthy and rejuvenated it’s crazy. It’s literally one of those products you have to try to understand. I can not wait to try more of the Sunday Riley skincare range in the coming year. Almost done guys… When it comes to a treatment for those days you’re feeling a little spotty or blemishy, the Clinique Anti-Blemish Solutions Clearing Gel £20 is my ultimate go to. I can not explain how many people I have recommended this to, and it has appeared on The G Edit here, here, here, here and here. Literally so much love for this. You dab a little bit of the solution onto existing or upcoming blemishes and by morning they are gone. I call it the fairy god mother of skincare. Finally and last but far from least, we can not finish off a skincare routine with a nice bit of hand cream. I use a lot of hand sanitiser at work so my hands really dry up at times. My go to hand cream at the moment is the Aesop Resurrection Aromatique Hand Balm £19.90. There isn’t much to say about this other than it smells amazing, hydrates amazingly and leaves your skin feeling funky fresh ready for bed. This is definitely my bedside table staple product of the year. It never leaves my side. If you want a more in depth review about any of these products, type the name in my side search bar and a full review will come up! 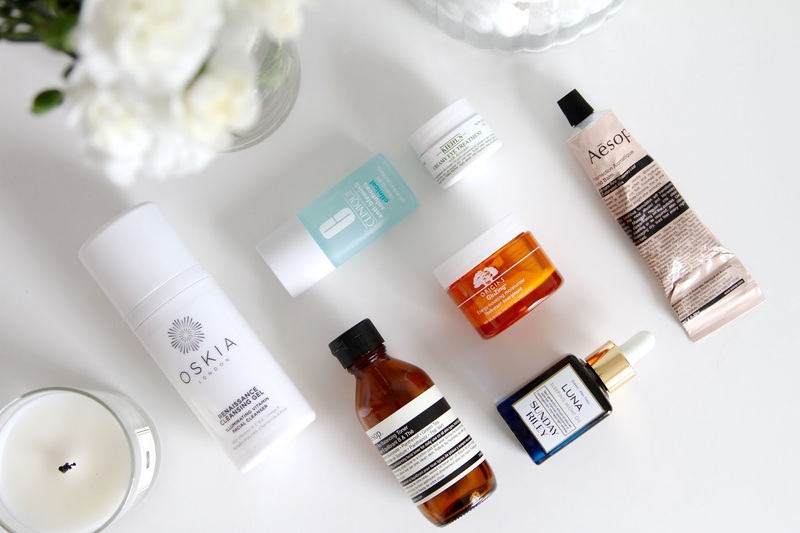 What are your swear by skincare products? Affordable or Luxe?